The Frank Slide is a natural landslide feature in the southern Rocky Mountains of Canada, and a significant historical event in western Canada. Frank, Alberta is a coal mining town in the Crowsnest Pass, Alberta. On April 29, 1903, at 4:10 a.m., 90 million tonnes (30 million cubic metres) of limestone crashed from the east face of Turtle Mountain and covered approximately three square kilometres of the valley floor. The slab of rock that broke free was approximately 650 m high, 900 m wide and 150 m thick. The slide dammed the Crowsnest River and formed a small lake, covered 2 km of the Canadian Pacific Railway, destroyed most of the coal mine's surface infrastructure, and buried seven houses on the outskirts of the sleeping town of Frank, as well as several rural buildings. 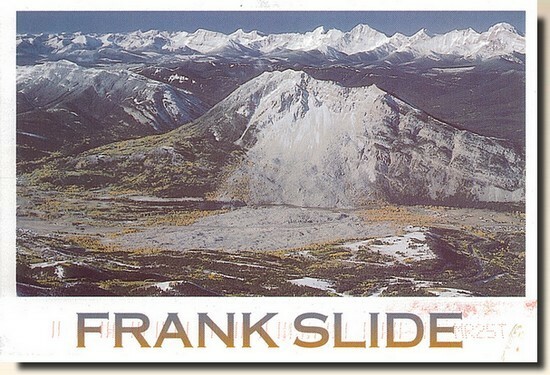 Frank was home to approximately 600 people in 1903; it is estimated that 90 of the roughly 100 individuals in the path of the slide were killed.